The sofa is one of the major pieces of furniture in your living room, with major impact on the overall aesthetic and energy of the room. With hundreds of styles, shapes and customization alternatives available, choosing the perfect sofa for your living space can be overwhelming for the uninitiated. You don’t want to regret coughing up thousands of Ringgit for a sofa that looks pretty on the catalogue or showroom, but doesn't look quite right in your living room. To help you find the perfect sofa, here are four questions you should answer before making such a a major purchase for your home. 1. How big is your living room? As logic dictates, the bigger the room, the more options you have in picking your perfect sofa. If the picture above is a little too flamboyant for your tastes, consider getting a simple sofa or an L-shaped design if you want to include other pieces of furniture and a coffee table. If you want a sofa to be the focal point of your room, look for sofas with rounder shapes. For smaller living rooms, pick a smaller, more practical sofa that doesn't overwhelm and take too much space. 2. What is your primary activity in your living room? If you're a couch potato who loves lounging around your living room catching up on your favorite television programmes, by all means pick a sofa that fits perfectly right in front of your TV. However, for the more sociable types who love having guests over for a night of talking & laughter, consider a semi-circle design with a central table to facilitate conversation and eye contact. 3. What material or color is practical for your living situation? Stay away from white suede sofas, especially if you have small children or pets roaming about. 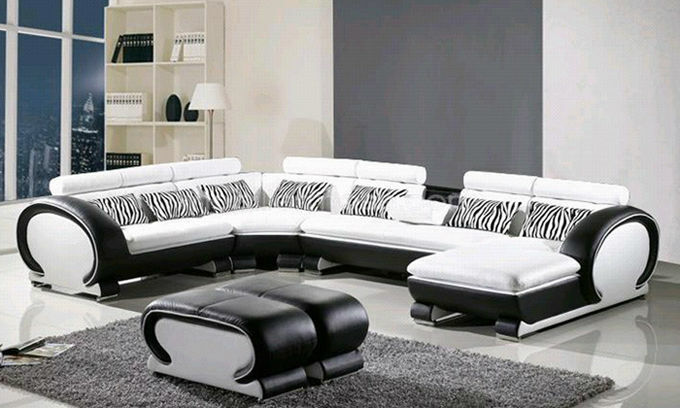 In this case, leather sofas in darker colors will be a more reasonable option as they generally wear well with age and are relatively easy to clean. Another viable alternative for family homes are sofas with outdoor fabric, making it more resistant to stains and color fading from the elements. 4. What is your personal style preference? If your style is sleek and modern, choose a sofa with clean lines and dramatic colours. If your home is an eclectic mix of inspiration and design, you might consider a sofa that combines several design principals, such as a vintage sofa wrapped in colourful fabric. For traditionalists, a classically structured sofa in neutral colours and wearable fabric will suit you better. Armed with this checklist of 4 important questions, you stand a better chance of findiing the perfect sofa for your living room, saving you from a lifetime of regret in the future.